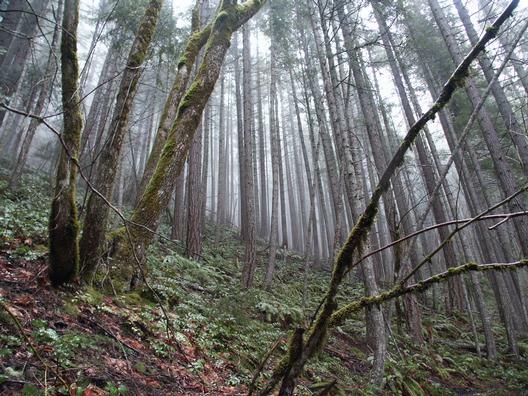 The drizzle at the Fairview Creek trailhead had all opting for raingear. A short scramble up the hillside past some soon-to-bloom fawn lilies got us to the start of presumed “Hardscrabble Ridge” trail. Several patches of calypso orchids were found a short ways up the trail, some growing right in the tread. Scattered madrone, cedar, chinquapin, ponderosa, and yew were seen throughout the hike, along with the more common doug fir and hemlock. The trail was compared to the Hardesty Mountain trail — though I’m unsure if it’s because of the scenery (trees, trees, more trees), the steepness, or the similarity of names (HARDesty vs. HARDscrabble). Trail improvements, including several barrier logs and even a small log footbridge, suggest that this otherwise unmaintained trail has been, and is still being maintained by “trail fairies”. Cut salal and Oregon grape branches attested to recent brush clearing efforts. At one point we peered into mine entrance, water dripping from the ceiling, but were not prepared to investigate further. After hiking for about a mile, it became apparent that the trail was not following the route shown on the topo, the USGS “Fairview Peak” quad, 1997. We were paralleling Sharps Creek quite a distance below the ridge, whereas the map shows several hairpins with the trail climbing to near the top of the ridge. Perhaps we had missed the first bend, and had continued along a miner’s trail? At the end of an open hillside, the trail vanished, but we picked it up again by scrambling up about twenty feet higher. After hiking for about two miles, and gaining 2200', we came upon a miner’s cabin nestled in the trees. From there we headed north on what appeared to be an old road, but were turned back by a dense rhody thicket. We retraced our steps back west of the cabin, and scrambled up a steepish, but rhody free, slope. We stopped for lunch at noon, on top of a moss-covered bluff. Fog withheld from us the views of the surrounding hills. Below us, shaded by trees, where several patches of snow. After lunch, we continued on north, and up, searching for the elusive “Judson Rock” and the trail. From the high point we proceeded west down the ridgeline. On the north slope of the ridge were scattered snow patches above 4000' elevation. We soon found a distinct trail — but it heads off in the wrong direction! 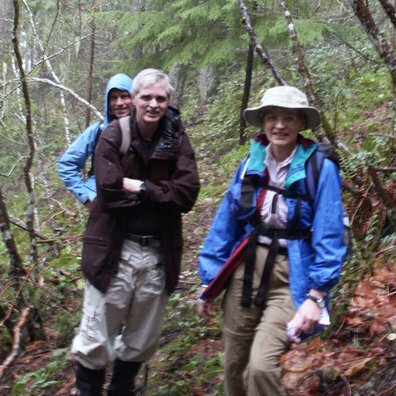 Perhaps it is the continuation of the Hardscrabble Ridge trail? We decided to leave exploration of that for another time, continuing west down (and up!) 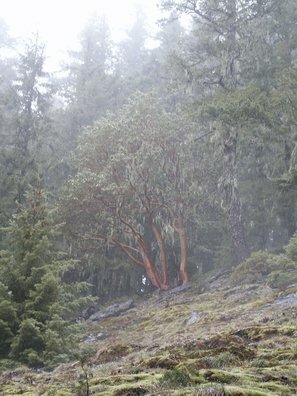 the ridge instead, battling occasional rhody and knee-high salal patches along the way. A vertical mine entrance was found, with an aluminum ladder nearby. That and several pieces of flagging-tape indicated that we were not the first to pass this way. After snacking on an open rocky patch, we continued downward on the south flank of the ridge. Eventually we came to the trail we had gone out on, about ¼ mile east of the Fairview Creek trailhead. Mountain goats were Gerry Roe, Fred Felter, Stewart Hoeg, and Wayne Deeter (lead billy).